January 2018 – Confianza Consulting, Inc.
Top Democrats are questioning President Donald Trump’s infrastructure plan even before it’s released, raising doubts about whether the administration’s approach can win bipartisan support. Trump has long touted his plan to upgrade U.S. public works as something that can win Democratic backing, and he will appeal to Democrats on infrastructure in his State of the Union address on Tuesday. He’s offering at least $200 billion in federal money over 10 years to spur states, localities and the private sector to spend as much as $1.6 trillion. Democrats say that’s not nearly enough. Senate Minority Leader Chuck Schumer and other Senate Democrats have called for $1 trillion in federal investment. The American Society of Civil Engineers has said more than $2 trillion in additional funding is needed by 2025 to upgrade conditions of everything from roads, bridges and airports to mass transit and drinking water. Infrastructure is the next big item on Trump’s legislative agenda, after a failed attempt to overhaul health care and passing a tax bill last year. But Democrats’ call for more funding comes in addition to the tax measure costing $1.5 trillion over 10 years, and Republican leaders say they don’t want a big spending bill. The push also follows the acrimonious government shutdown, and lawmakers are already fighting about budget spending with mid-term elections looming in November. Trump is expected to tout his infrastructure plan in his State of the Union speech, and detailed principles will be transmitted to Congress a week or two after that to start the legislative process, adviser DJ Gribbin said. With Republicans controlling the Senate by only a 51-49 margin, Trump needs Democratic votes. It’s unlikely an infrastructure bill can pass on a simple, party-line majority, the way the tax overhaul was enacted last year, using what’s known as budget reconciliation. Delaware Sen. Tom Carper, the leading Democrat on the Senate Environment and Public Works Committee and a former governor, said he supports encouraging states and localities to generate funding for projects. But he returned from a meeting with administration officials earlier this month skeptical about their approach. Rep. Bill Shuster, the Pennsylvania Republican who is chairman of the House Transportation and Infrastructure Committee, said he has told Trump that any bill must be bipartisan and fiscally responsible. Democrats will want to address the Highway Trust Fund, which uses primarily federal fuel taxes to help fund state and local projects but is projected to become insolvent by 2021, Shuster said. Republicans don’t want deficit spending, he said. Trump will appeal to Democrats in his State of the Union speech that a bipartisan approach is needed to rebuild the country, Marc Short, the White House legislative affairs director, said on “Fox News Sunday.” Trump has eyed Democratic support for his public-works plan, in part because it means jobs for the Democrats’ traditional allies in labor unions. There’s no doubt that Democrats in Congress will want more federal dollars, but there’s a significant debt problem in the U.S., Short said. “This can’t just be all federal largess that pays for this,” he said. Some governors and mayors have said they’re already paying their fair share and that they need a better federal partner. But Trump wants to allow communities to keep more of their funds, make their own decisions, and “simplify the federal bureaucratic maze,” White House spokeswoman Lindsay Walters said. “The Washington establishment still thinks that infrastructure can only be built correctly if they make all the decisions and control the purse strings, but one look at the crumbling bridges and roads across America shows that approach has failed,” Walters said in an email. Still, allocating $200 billion in federal funds is “a drop in the bucket” compared with the cost for slashing taxes for corporations and the wealthy in the tax bill, said Sen. Ron Wyden, the top Democrat on the Senate Finance Committee. It appears Trump also wants to shift the funding burden to states and cities already strapped for cash, he said. Trump’s White House wants to change the approach to funding projects to reduce over-reliance on federal money and get more public works built and maintained. A leaked draft of principles that emerged this week said half of the federal monies would go toward incentives in a competition to encourage non-federal entities that own most assets to secure their own funding for projects. Tax-exempt bonds also would be expanded to help attract private investment, according to the draft. Gribbin said the White House is “open to conversations” with lawmakers about increasing the $200 billion, and the administration is purposely not including new revenue in its proposal to allow those details to be negotiated with Congress. Congressional Republicans have been supportive of streamlining project approvals and leveraging federal dollars, though lawmakers who represent rural areas, including John Barrasso of Wyoming, chairman of the Senate Environment and Public Works Committee, have expressed concerns about relying too heavily on private investment that doesn’t work well in less-populated areas. Barrasso has said his panel was working on a bill while waiting for a White House proposal. Committee Democrats outlined a blueprint in July that called for more than $500 billion and may draft their own measure, Carper said. Other committees would also be involved. “I think the administration really wants to be bipartisan on infrastructure and wants to include Democrats and wants Democrats in the room when the bill is written and when the funding sources are really determined,” said LaHood, who is a co-chairman of Building America’s Future. Even so, getting a major infrastructure bill enacted in 2018 will be “an uphill climb,” said Stephen Sandherr, chief executive officer of the Associated General Contractors of America, representing more than 26,000 construction companies and other firms. Sandherr said a lot of his members are more optimistic than he is because of the partisan political battles during the past year. Just 20 cities are left standing in the competition for Amazon’s second headquarters and the 50,000 jobs it will bring. Now comes the hard part for the finalists — and for Amazon. Based on the cities that made the cut, and what the company told some of the cities that didn’t, the company will likely scrutinize six key criteria when making its final call. It plans to announce its decision later this year. In whittling down the remaining field, Amazon rejected bids from more than 200 prospective cities. Bids from Detroit, Memphis, Kansas City and the state of Delaware were among those that were denied. Aside from the 50,000 jobs that are expected to accompany the new headquarters, Amazon says it will contribute more than $5 billion in construction costs toward the new facility, as well as tens of billions of dollars more in indirect economic activity as a result of its arrival. The ecommerce giant estimates that its investments were worth $38 billion to Seattle’s economy from 2010 to 2016. The 20 cities that made the first cut include Austin, Texas; Atlanta; Boston; New York City; Washington, D.C.; Los Angeles; and Nashville, Tennessee. Among all of Amazon’s needs, high-skilled workers are at the top of the list. The company has ventured far beyond retail and shipping into cutting-edge technologies, including artificial intelligence, robotics, drones and voice recognition for its home speaker, the Echo. That’s likely to give a leg up to cities that already have large tech sectors, such as Boston, New York, Washington D.C. and Raleigh, North Carolina, all of which were on Amazon’s list. “They’re going to want to see that in the current workforce, but will also want a community that can come together and marshal that in short order,” said Alan Berube, a senior fellow at the Brookings Institution’s Metropolitan Policy Project. That means strong relationships between area businesses, community colleges and universities. Amazon executives bluntly told officials from Kansas City, Missouri, that the region’s lack of highly-skilled technology workers cost it a spot on the final list, according to Tim Cowden, CEO of the Kansas City Area Development Council. The state of Connecticut applied for HQ2, including proposals for Hartford and Stamford. But it was told the cities weren’t big enough. “We received positive feedback from Amazon officials, but at the end of the day did not have a large enough metropolitan area for this particular proposal,” Governor Dannel Malloy said. Smaller cities on the list, such as Raleigh, Nashville and Indianapolis might be challenged by the sheer size of Amazon’s expected needs. Nine of the nation’s 10 largest metros are on Amazon’s list. “Even among the largest places on the list, the market for tech workers would be transformed by the new demand for 50,000 workers,” said Jed Kolko, chief economist at Indeed, a job listing website. Denver, Pittsburgh, Austin, Indianapolis, Nashville, Raleigh and Columbus, Ohio — all among the top 20 — all have populations smaller than Seattle’s roughly 3.8 million. That could make it harder for those areas to provide enough top-notch technical, managerial and financial talent. Not all those 50,000 workers have to be located right now in whatever site Amazon chooses. The company said its 50,000 hires will occur over 10 to 15 years, and it clearly expects to pull in talent from elsewhere. Amazon says it wants a city with amenities that its future employees will want to move to. That includes everything from bike lanes to fast Internet and mobile phone connections to “recreational opportunities,” according to Amazon’s request for proposals. That could help Nashville, with its music scene, or Denver, with its proximity to the Rocky Mountains. But it could also benefit cities with cheaper housing and lower overall costs, such as Pittsburgh, Indianapolis, Atlanta and Philadelphia. “The thing that will attract people more than anything else is an engaging job at a high wage, especially if their high wages aren’t eaten up by high housing costs,” Kolko said. Most cities on the list can fulfill that demand, Berube and other economists said, with the possible exception of Indianapolis. Columbus is the home of Ohio State, while Nashville has Vanderbilt. Pittsburgh boasts Carnegie Mellon, which houses leading programs on artificial intelligence and robotics. One thing Indianapolis does have going for it, Berube noted, is that city residents recently approved an additional tax to pump millions of dollars into buses and light rail. Most of the other finalists have extensive public transit systems, said Tom Stringer, a managing director at BDO Consulting, who leads the firm’s site selection practice. A large, international airport within 45 minutes is also critical, particularly for frequent flights to Seattle and beyond. That could be a roadblock for smaller cities such as Columbus, Indianapolis and Pittsburgh. It won’t all depend on objective criteria, to be sure. Newark may very well have landed on the list at least partly because it and the state of New Jersey offered $7 billion in tax breaks and other incentives. “They’re not a half-trillion dollar company for nothing, and they are going to see what they can extract,” Berube said. That might inflict pain in the Washington, D.C. region, which has three locations on the list: The city of Washington itself, suburban Montgomery County, Maryland, and Northern Virginia, a collection of counties to the south of the city. The company could play all three against each other, Berube said. Toronto, the only city outside the United States to make the cutoff, has said it won’t offer tax breaks or other subsidies. WEST PALM BEACH, Fla. — On the eve of Brightline passenger rail launching in South Florida, the railroad already is looking beyond its original goal of service between Miami and Orlando. Brightline’s intercity system could be expanded within Florida to Jacksonville or Tampa and could be replicated in other states with similar demographics, including Georgia and Texas, railroad officials said at a media event Friday. Brightline — the country’s only privately owned and operated passenger railroad — is to officially begin passenger service Saturday morning. For now, trains will run between West Palm Beach and Fort Lauderdale. But the railroad will expand to Miami later this year, with full service to Orlando still two years away. 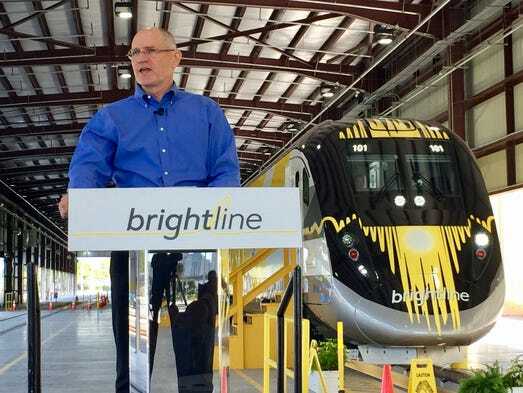 Elected officials and members of the media on Friday took the 40-minute trip on BrightGreen, one of Brightline’s five colorful diesel-electric trains. 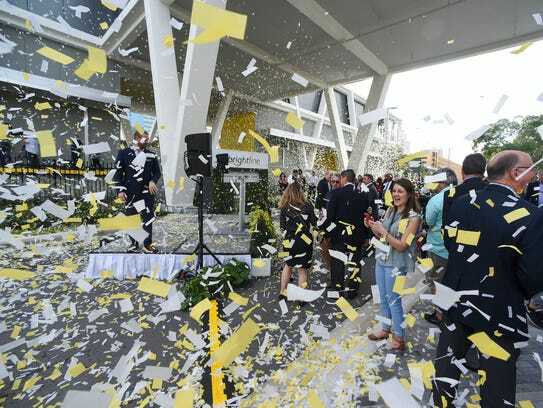 It was a chance for the $3.1 billion railroad to show off the amenities they say will set Brightline apart from other forms of public transportation, including Tri-Rail, South Florida’s existing commuter rail. 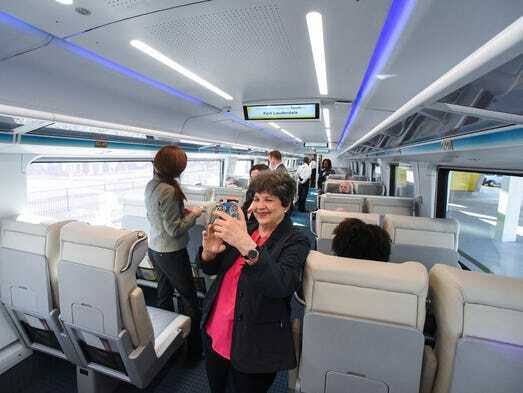 Leather seats, wide aisles, bike racks, free wireless Internet — with two power outlets and two USB ports per seat — are among the amenities Brightline says will appeal to its target customers, which include tourists, business travelers and Millennials. 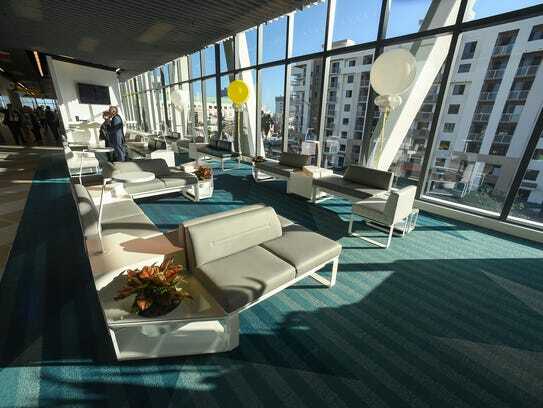 Friday’s event also was a chance for Brightline to introduce the staff that it says will provide world-class hospitality. Walker said she believes the staff, many of whom are Millennials, are helping to create a vibrant atmosphere aboard the trains and in the stations. But even with the launch of service just hours away, Brightline officials on Friday were focused on the future. The project’s successful launch — and performance in the coming years — could have implications for passenger rail nationwide, Edens said in an interview with USA TODAY. To be economically viable, the railroad must capture 2% of the approximately 100 million annual trips between Miami and Orlando, according to Edens. The private-equity investor and co-owner of the NBA’s Milwaukee Bucks said he’s confident Brightline will deliver. “The service offering and the convenience and the expense of it are so compelling that 2% seems like a good risk,” Edens said. Brightline eventually could capture up to 20% of the travel between Miami and Orlando, the most visited city in the United States, according to Edens’ estimates. Amtrak’s Northeast Corridor service, by comparison, captures 12% of the travel between New York and Washington, he said. The Brightline model could be replicated in other highly populated, highly congested city pairs, such as Atlanta-Charlotte, Houston-Dallas and Dallas-Austin, according to Edens. The company has long said that its use of the Florida East Coast Railway — a Miami-to-Jacksonville corridor established in the late 19th century but currently used only for freight — was a key factor in making Brightline financially viable. Similar infrastructure exists in Texas and Georgia and is, in fact, abundant in many areas of the country, according to Edens. Within Florida, Tampa and Jacksonville are among the most obvious expansion opportunities, Edens said, adding that each comes with unique benefits. Expansion from Orlando to Tampa, Florida’s second-largest city by population, would be aided by the fact that the state owns right-of-way between the cities, while an expansion to Jacksonville, the northern terminus of the Florida East Coast Railway, would have the advantage of the existing infrastructure, according to Edens. Introductory fares between West Palm and Fort Lauderdale are $10 each way for Smart Service, Brightline’s coach class, and $15 for Select Service, its business class. Seniors, active military personnel and veterans will receive a 10% discount, and children younger than 12 will ride for half price as part of discounted introductory fares, according to Brightline. Initial service will include 10 daily round trips on weekdays and nine on weekends between 6 a.m. and 11 p.m.
Brightline ticketing and schedule information is available online and through the railroad’s new mobile app. Policymakers need it; private transportation companies have it. Here’s one way to broker a solution. How, exactly, should policymakers respond to the rapid rise of new private mobility services such as ride-hailing, dockless shared bicycles, and microtransit? As I argued here several months ago, in order to answer that question city leaders will need accurate and detailed information about all urban trips—however the traveler chose to get from one place to another. And that information needs to come in part from the private mobility companies that are moving a growing share of people within our cities. In 2017, these services had a tumultuous year. Apocalyptic images of discarded dockless bikes in China left American officials that are experimenting with this model for bikesharing scrambling to ensure their cities avoid the same fate. Meanwhile, Uber’s admission that it paid a $100,000 ransom to hackers who stole 57 million user accounts damaged that company’s credibility as a protector of passenger privacy. And a widely shared study from researchers at University of California-Davis refuted several optimistic hypotheses about ride-hailing’s societal benefits: It found that companies like Uber and Lyft are spurring urban congestion, siphoning public transit riders, and failing to entice many people to give up their cars. Not coincidentally, transit agencies like Washington, D.C.’s WMATA are now launching their own investigations to see if declining ridership can be traced to the emergence of ride-hailing. Beyond these broad issues, there are a number of specific questions that can’t be answered without access to trip information from Uber, Lyft, Limebike, and the like. For example, without such data it’s hard for policymakers—or the general public—to decide if it’s a good idea to convert a parking meter to a ride-hailing drop-off point, or to ensure pedestrians aren’t obstructed by heaps of dockless bikeshare bikes on the sidewalk. Unfortunately, new mobility services have generally refused to let the public sector see inside their data vaults. But the tide is turning, especially as the line between public and private forms of urban transportation blurs. American transit agencies are partnering with ride-hailing companies to offer late-night service, move people to bus or rail stations (“first mile/last mile” solutions), and manage paratransit for riders with limited mobility. Ride-hailing companies are in an awkward position if they refuse to share data with governments that subsidize them. “If I’m paying you to move a passenger, the data for that passenger isn’t yours,” I heard a Texas transit official say recently to a ride-hailing executive. “It’s mine.” The executive had no response. When will policymakers finally be able to access the data they need to manage streets and sidewalks in the public interest, and how will they get it? The most likely solution is via a data exchange that anonymizes rider data and gives public experts (and perhaps academic and private ones too) the ability to answer policy questions. This idea is starting to catch on. The World Bank’s OpenTraffic project, founded in 2016, initially developed ways to aggregate traffic information derived from commercial fleets. A handful of private companies like Grab and Easy Taxi pledged their support when OpenTraffic launched. This fall, the project become part of SharedStreets, a collaboration between the National Association of City Transportation Officials (NACTO), the World Resources Institute, and the OECD’s International Transport Forum to pilot new ways of collecting and sharing a variety of public and private transport data. Kevin Webb, the founder of SharedStreets, envisions a future where both cities and private companies can utilize SharedStreets to solve questions on topics like street safety, curb use, and congestion. That’s a laudable goal, but Shared Streets will have to solve several challenges in order to become a go-to resource. For example, it’s hard to provide a complete picture of urban mobility unless the heavyweights like Uber, Lyft, Didi Chuxing, Ofo, and Mobike participate; so far none of them has signed on. There is also the question of how tech behemoths like Google and Apple—collectors of massive datasets about individuals’ movement—can be involved. Perhaps they can be sources of reliable revenue that SharedStreets will need in order to scale (at present the initiative is being incubated with philanthropic support). Finally, there is the critical question of privacy. Although Uber’s hacking scandal has dinged ride-hailing’s credibility as a protector of passenger data, new mobility services do have a point when they push back against handing over rider information to the government. It’s reasonable to assume that at least some customers will balk at the prospect of public agencies accessing their personal ride histories. Webb says that SharedStreets will handle those concerns by collecting aggregated data that is rich enough to allow for deep analysis while still hiding information about individual rides. New mobility service companies could further protect their passengers by converting trip data into so-called “synthetic populations” of artificial data modeled after trips that people actually took. However the new mobility service data arrives—almost certainly aggregated, and potentially artificially modeled—there will need to be a way to ensure it is accurate. After all, companies like Uber and Lyft have a vested interest in the questions policymakers pose about their impact on city streets. Data validation—especially for modeled data—is crucial for such an exchange to be trusted. While much of CES is focused on the smart home, Bosch is looking beyond our abodes to the mega metropolises that house them. Leveraging its IoT, AI, software and sensor smarts – the building blocks of smart cities – the Germany-based business is already working to cure many of the ills that plague large urban areas, including traffic, pollution, high energy consumption and crime. In a CES Media Day presentation on Monday, Bosch Group management board member Dr. Stefan Hartung and Mike Mansuetti, president of Bosch North America, cited 14 current “Beacon” projects in metroplexes worldwide, where “The smart city of the future is already here,” Hartung said. Among the pilots: A connected-parking program, being tested this year in 20 U.S. cities, in which specially-equipped cars automatically report available parking spaces to the Cloud as they pass, helping to reduce traffic, fuel consumption, pollution and time spent hunting for a spot. The company is also outfitting 5,000 streetlights in San Leandro, Calif., to only illumine when needed, which is expected to save the municipality $8 million over 15 years. On the product front, Bosch has developed a shoebox-sized micro-climate monitoring unit called Climo that urban managers can use for traffic control. A winner of a CES 2018 Innovation Award, the device is one-tenth the cost and one-hundredth the size of standard monitors, Mansuetti said. The executives also touted a telematic eCall plug, which fits into a car’s cigarette lighter and can monitor and report the driver’s performance, and emit an emergency alert signal if needed. The device can help calm parents of young drivers and reward safe motorists with discounted insurance rates. To help make smart cities a reality, Bosch has deployed 4,000 IoT engineers and is operating three AI research centers, in Germany, India and Silicon Valley. Why the urgency? According to Hartung, two-thirds of the world’s population will be living in mega cities by 2050, while Mansuetti pointed to the big business that smart city has become: 19 percent annual growth and a projected 800 million Euros in expenditures by 2020. The Miami Urban Future Initiative is a joint initiative with FIU’s College of Communication, Architecture + The Arts and CCG sponsored in part by The John S. and James L. Knight Foundation, which will lead new research and mapping on economic, occupational, creative and technological assets in Miami, in partnership with renowned experts, to provide necessary data, evidence and strategy to grow a more inclusive, creative economy for a 21st century global Miami. Miami has reached a crossroads. Its economy – historically based on tourism, hospitality, transportation, and real-estate development – has deepened, diversified, and become more creative and idea-based, as banking, media, arts, education, and new technology-based industries have assumed a larger role. The region now finds itself at a critical inflection point. While growing, Miami’s creative class — those who make a living by using their minds in arts & design, science, technology, law, & medical industries or academia, media, management, & finance — only make up 25% of the workforce, a much smaller share than regions like Washington, D.C. (44.6%), Chicago or& L.A. (31.5% each). Miami also suffers from challenges arising from a rapidly growing urban center. This Initiative will develop additional research about Miami’s creative economy and divides, while working across the business, civic, and academic communities to shape a constructive, future-oriented dialogue. Through this Initiative, they hope to provide the thought leadership and awareness required to guide Miami’s evolution as a global city through data-driven research and assessments of the key trends shaping the region, disseminate this information and inform the broad strategic vision for the region’s private and public stakeholders through ongoing local convenings and briefs and bring global thought-leaders and practitioners to bear on thinking about the region’s future through high-level events and convenings on issues important to Miami and global cities. More than two decades ago, Alejandro Portes, now at the University of Miami, and Alex Stepick of FIU dubbed Miami as a “city on the edge,” with many assets and many challenges. The region’s transformation, they added, was a story of “change without a blueprint.” Miami has seen one of its greatest growth waves since that time, benefiting from the strategic action of visionary stakeholders, groups, universities and colleges, and mayors since. It is now time to renew the region’s commitment to a regional strategy and to engage a broad region-wide conversation about a more inclusive prosperity that takes into account the mounting realities and challenges that face the region today. The time to act is now: if it misses this opportunity, the region risks losing the economic advantages it has achieved. To this end, FIU’s College of Communication, Architecture + The Arts and Creative Class Group (CCG) created the FIU-Miami Creative City Initiative, an ongoing collaboration to better understand the forces that are shaping the future of Miami. Their aim is to build upon the strong foundation created by the region’s political, business, academic, and civic leadership and organizations over the past several decades to help identify the key things Miami can do to position itself as a more innovative, creative, inclusive, and prosperous global city and region. Income Inequality. Miami ranks second among large U.S. metros in terms of income inequality. Wealth Segregation. Miami ranks tenth among large U.S. metros according to its segregation of the wealthy, a measure of the residential segregation of households with incomes of $200,000 or more. Overall Segregation. Miami ranks sixteenth among large U.S. metros on the Segregation Inequality Index, a combined measure of economic segregation and both wage and income inequality. Housing Unaffordability. Miami ranks among the twenty least-affordable metros in the world in terms of its “median multiple,” or ratio of median housing prices to median household income. Concentrated Poverty. 14 percent of Greater Miami households and one in five families with children lived below the poverty line. Middle Class Decline. In Miami, the middle-class share of population declined from 51 percent in 2000 to 48.5 percent in 2014.